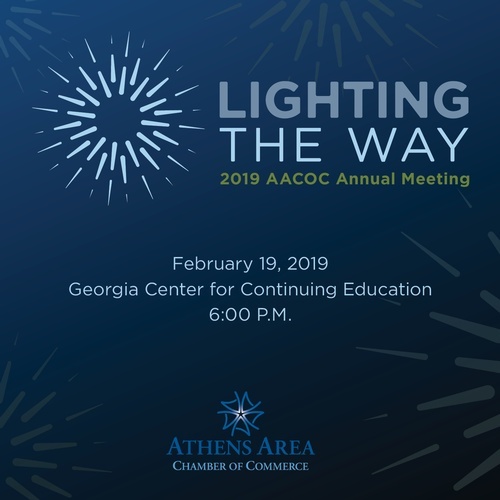 The AACOC Annual Meeting is an opportunity for our members to gather and reflect on our accomplishments of the past year and look ahead to the future.2018 Board Chair Dr. Shannon Wilder, Director of Service Learning for the University of Georgia, will hand over the gavel to Chuck Toney, Executive Director of the Food Bank of Northeast Georgia and both will deliver brief remarks on the state of the Chamber of Commerce. The Chamber of Commerce will also unveil its new mission and vision as well as the strategic plan for the next five years. This year's event is not a seated dinner, rather a cocktail function to encourage mixing and mingling among members!